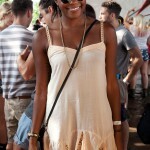 Governors Ball, an annual Music Festival held on the Randall’s Island brought about a lot of original outfits in best traditions of the New York street style. Let’s take a look at the fashion highlights that were spotted in this grandiose event despite the outrageous pouring rain during the passing weekend. Well, the passing weekend was very interesting, especially on the Randall Island, New York City where an annual music festival took place. While the music was roaring what was especially pleasing was too see a lot of amazing and daring outfits that fashionistas wore to the event despite the muddy grounds. There were lots of shorts despite the bad weather, like the ones we see on the girl in the above picture. She paired the high-waist cut offs with a simple red tee and a striped white jacket. Quite patriotic, don’t you think? Another girl in lace shorts and simple white top was also wearing a nice flower head wreath. That seems to be hip trend of the Music Festivals, don’t you think? 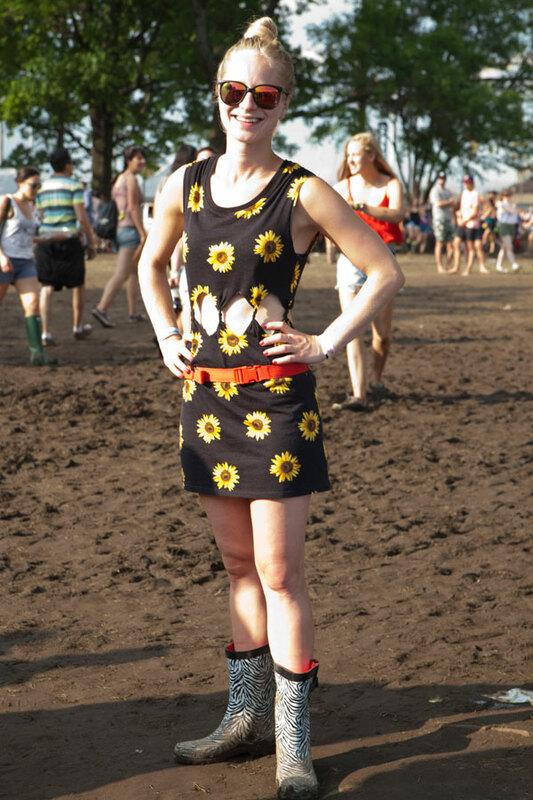 Did you notice her awesome boots? Among other outfits spotted in the event were cute mini-dresses in various prints. 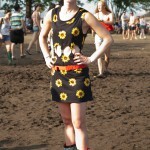 There were floral prints: huge like we see on a girl with large sunflowers on her little black dress, or small flowers; tribal abstract prints, and mostly all of these outfits were finished off with rain boots or army boots. Of special interest were also skirts. 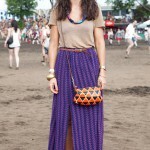 There were high waist pretty skirts with short tops and maxi-skirts with intriguing clutches in geometrical prints. Accessories were also a great part of the fashion highlights, as we see lots of clutches, bracelets, earrings and necklaces. So, how do you like the amazing outfits present at the event?